Speciality: Computational Geometry, Complexity Theory, Database Complexity, Distributed Information Systems and Parallel Programming. Short CV: Vasilis Samoladas is an Associate Professor at the School. of Electrical and Computer Engineerong of the Techincal University of Crete. He holds a PhD (2001) and an MSc (2995) inComputer Science from the University of Texas at Austin and a diploma in Electrical Engineering from Aristotle University of Thessaloniki (1992). 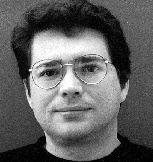 His research interests lie in computational geometry, in information systems (database systems, distributed systems) and in quantum computation. His PhD thesis concerned the complexity of external memory data structures. His published work has appeared in leading journals (JACM,Algorithmica,VLDB Journal) and conferences (PODS,ESA,ICDE,VLDB,ICDT) and he received a best paper award in PODS'98. He has served in several program committees (SIM,AAMAS,ISWC,VLDB,ESWC,ESW,SDM,CIKM) and was program chair for the 7th Hellenic Data Management Symposium (HDMS'08). He has attracted funding from national and EU sources. He is a member of the Software and Networked Systems Lab (Softnet) and he is the scientific coordinator for High-Performance Computing at the Technical U. of Crete. Research Areas: His interests lie in computational geometry, complexity theory, multidimensional range searching, database complexity, distributed information systems and parallel programming.